Best Quality Kayak Roof Rack on the Market, Rust Free, Easy Assembly, Professional Manufactured. designed mounts to virtually all crossbars and load bars on the market. The carrier secures the kayak on its side, consuming minimal space on the load bar. As shown in the pictures we put the Kayak Rack on the Ladder Rack Bar. (sold separatly). A maximum of 4 sets of kayak racks can be mounted on a full size truck. Save your space. 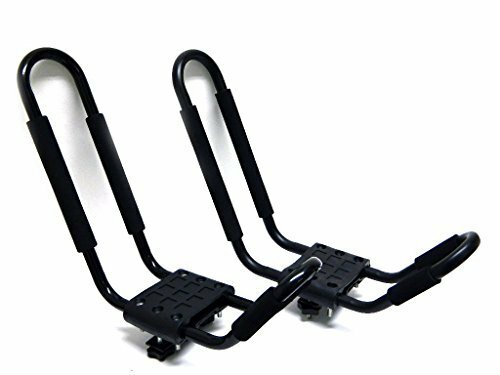 1.5mm Steel Tube design with Rubber padding for carrying strength and kayak protection, it can hold up to 150lbs Kayak or Canoe, Wide mouth J bar offers easier loading and unloading, Quick on/off hardware ensures fast installation and removal. Please Check picture for Size & Dimension. If you have any questions about this product by A-Smart®, contact us by completing and submitting the form below. If you are looking for a specif part number, please include it with your message.